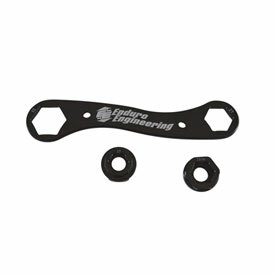 Perfect axle wrench tool to carry out on the trail or store in your tool box. Wheel axle, front a rear, also a spark plug tool. All in 1.. This a must tool if you ride in remote areas where you may need to work on your bike..light weight, has all the sizes for my 2 stroke bike.. FINALLY! A tool for that dang axle nut! This tool is extremely handy for anyone with a KTM. The rear axle nut (27mm?) was hard to find the right size for, and this compact, lightweight tool tackles that problem and gives you other size options along with it. Perfect stocking stuffer for someone who bleeds orange. This is what my tool kit was missing ! Light weight, strong and easy to pack. I don't just use it I'll n the trail, but even in the garage and working on the lathe. Finally! A 22mm trail side tool that fits my WR450 front axle nut! I wanted a tool for trail side repair to allow front axle removal on my 2005 WR450. Before finding the EE multi-tool, I had to return two different sets of wrenches because the 22mm ends would not fit on the front axle nut. The bottom fork casting/bracket caused wrenches to not sit flush on the nut. The 22mm adapter with the EE multi-tool fit perfectly, and allowed a bit of a stand-off, so the wrench had no problem clearing the fork casting. As an added bonus, I now have the 30mm wrench for any steer head adjustments needed on the trail. I wish I had tried this wrench first before wasting my time and energy on the other cheap options out there. Fits all the right fasteners, including spark plugs. Exactly what I was hoping for. I do wish there was a built in way to tether the insert to the wrench so it doesn't get lost. Fits perfect in my tool kit. Just long enough but not to long. Super light weight and durable. Not noticeable in tool pack. Works great, I have a KTM 2017 250 xc and this wrench works double time. It also works on spark plugs. What is the length of this tool? Need to make sure it will fit my fanny pack. I have 2006 KTM 300XCW. Will the spark plug insert fit between the frame and spark plug? There is not much room to get anything in there. I use an open end wrench now. BEST ANSWER: I feel your pain. I think it will from my experience (05 EXC250), but it will be close. Get the NGK iridium shorty plug (BR8ECMIX I think it is) if it fits your model. Solves the issue of clearance altogether and you have a better plug that you won't worry about fouling. Yes it will fit between the frame and the top of the spark plug. Anyone successfully used this on a 2018 250XCW? I can not get it on the spark plug and turn the plug.. it hits the fuel tank. Works great everywhere else! BEST ANSWER: Yep, I had to remove the tank on my 2009 250 XCW. Do you have a wrench similar to this for an 06 KTM with a RFS motor? Does this fit the front axle on a 2018 ktm? Anyone know total weight for the wrench with the 17mm adapter socket?